FFXV:ANEHub - Final Fantasy XV: A New Empire strategy guides, battle tips, and up-to-date news. Learn how to upgrade your hero, rally empires, defend against strong enemies, and become the Supreme Emperor of the Titan! Behold: The Power of Ramuh is at our Fingertips! Whip Up A Tasty Treat in the Diner! Understanding the building that has little to say but a lot to offer. Aloha, my courageous kumquats! I see I have tricked you, yet again, into reading another one of my articles. No worries though; this one is short and sweet. Why will this benefit you? Today we are discussing the Defense Ministry. Which is exactly as it sounds. Kind of. I mean, it’s not much…but at the same time, it is quite helpful. Am I confusing you? I’ve already confused myself. A look at the new Defense Ministry building. The Defense Ministry is a lovely little building that currently sits just to the left of the Ignis Diner. When you click on it, not a lot happens…you have the option to upgrade the building, and to get “more information,” which details what boosts you have received for the previous, current, and very next level(s). There are currently 10 levels to the Defense Ministry, which in turn gives boosts to your HP, Armor, Troop Capacity, and Training Queue. Here is a fancy little grid to show you what you can look forward to as you progress with this building. BEHOLD! A chart has been made! Defensively, these are HUGE boosts from what we have previously seen in other buildings (pre-Ramuh gear) and other various boosts and gems that we have come across in this game. For many, this one building alone is going to double their defensive stats–or at the very least, increase it exponentially–which will definitely help to keep out those pesky warriors that keep trying to invade your empire and steal that tasty paella Ignis is cookin’ up. From an attacker’s perspective, we know that pure attack doesn’t do much if we don’t have the proper HP and Armor to keep our troops alive to deliver the punches we’ve been training (::cough cough paying cough cough::) for. If adding to the ministry means we can overlook a more-balanced piece of gear for one that is heavy on attack, then that is definitely a boost you should get behind. 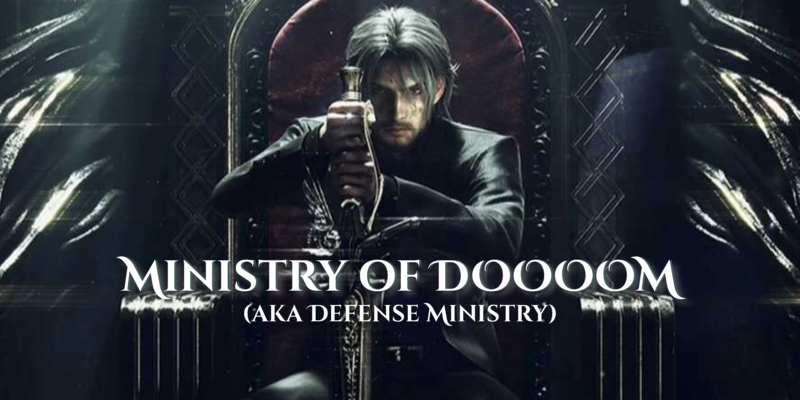 This Ministry of Doom–er, um, Defense Ministry, may not do much. We can speculate that behind closed doors, it may be giving pardons, offering absolution to parishioners, teaching some silly walks, or harboring jars of Wildfire. We really cannot say for sure. But what we DO know is that it WILL boost your empire’s Troop HP and Troop Armor stats significantly while also inflating your Troop Capacity and Training Queue as well, which makes this a building worthy of unlocking and utilizing for the player looking for a smart advantage. Until next time, my Coconuts! Like our content and want to stay up to date with our new releases? Make sure to connect with us on Twitter, Facebook, and Reddit! You can also chat with us on Discord or in our Facebook Group! March Event; Creation of the EOS Atlas!